The 15th and 16th centuries witnessed the creation of the powerful Ottoman Empire. It conquered not only all the Balkan States and most of Hungary, but even beleaguered the City of Vienna in the next century. Those fierce forces controlled Southeastern Europe for more than 150 years and ravaged the land and scattered the people during this time so badly that some areas lost all traces of civilization. When the Turks of the Ottoman Empire were finally defeated with the help of Baden’s Prince Eugen, it was the primary goal of Prince Eugen to colonize the land again and to make it fruitful. Emperor Charles IV, the Empress Maria Theresa, and Emperor Joseph II encouraged settlers, farmers and craftsmen primarily from West German lands to settle in the now ravaged land. They traveled not with wagon trains westward, but with barges eastward on the Danube River to reach their new homes. They settled on the potentially fertile land along that river as well as some of its tributaries and, hence, they were called the Danube Swabians. Many of the settlers never saw the fruits of their labours because of the famine and plague that swept through their ranks. The pioneer spirit prevailed however, and they not only re-established a civilization, but in the span of 200 years made this area one of the most fruitful in Southeastern Europe. 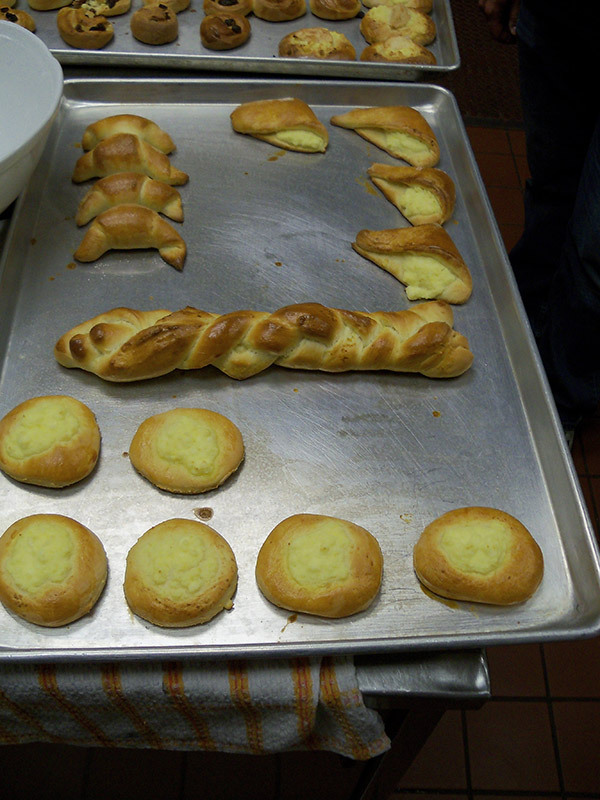 It was even referred to as the “Breadbasket of Europe”. 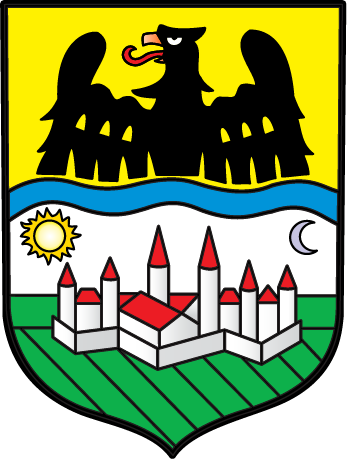 The Danube Swabians were extremely proud of their German language and cultural heritage, and lived in closely-knit settlements to maintain it. The number of settlers increased to such an extent that land became scarce and – that pioneering spirit still strong – many came to America at the end of the 19th century. Upon the conclusion of the First World War, when the Austro-Hungarian Monarchy was dissolved and this area was parceled up among Hungary, Rumanian and Yugoslavia; many more came to Canada as well. A major tragedy of the Second World War was the annihilation of approximately 250,000 Danube Swabians in the concentration camps of Tito. Furthermore, 100,000 of our people from Romania and Hungary were abducted to Russia and the Baragan steppes of Romania for forced labour. Many thousands perished. The largest part of the surviving Danube Swabians were forced to flee or were expelled from their homeland as a result of the ever advancing communism. Most of them sought refuge in the already overcrowded countries of Germany and Austria, where some of them still remain. For many Danube Swabians, the liberal immigration laws of Canada gave renewed hope and the opportunity to start anew – as their forefathers had done again and again. A large number settled in Southwestern Ontario, near Regina, Saskatchewan, and in British Columbia. Their diligence, honesty, and prudence gained them the respect of not only the other immigrants, but also of the Canadian public in general. They adapted quickly to the ways of their new home and many played a substantial role economically and politically. They are industrious workers, prudent investors, faithful and loyal citizens of Canada, but they never lost their pride in their heritage or their regard for moral values as when they were inculcated along the Danube River. 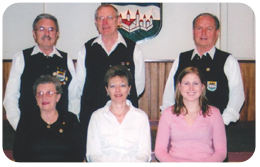 The Danube Swabians created organizations and associations such as ours [the Schwaben Club of Kitchener] to assist each other in time of sickness or need. They also supported German language schools, youth and sport groups, folk dancing groups, choirs, etc. All of this in the hopes of preserving their language, songs, dances and customs. 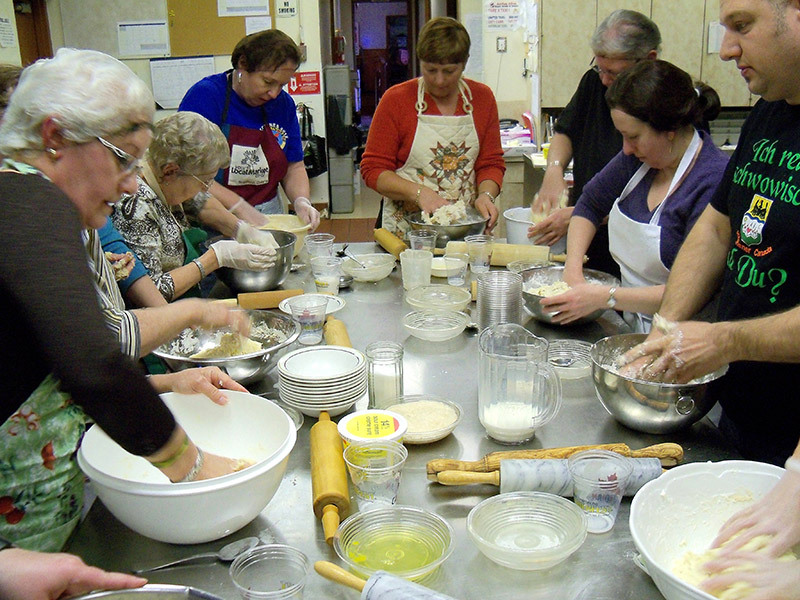 The Canadian Schwaben Sick Benefit Association of Kitchener was founded in 1931. Wilhelm Goss served as the first President, and their first meetings were held in their own members’ homes. The Club also shared a room Street with the Saxon Club at the Winter Garden at 33 King. The Schwaben Club was inaugurated to assist members who could no longer support their families due to illness or injury. Each member would pay their monthly dues, and the Club would then provide $10.00 a month, to cover living expenses, for members unable to work. That was considered adequate in those days. In its first year, the Club actually elected three Presidents; Wilhelm Goss, John Martin and Mr. Neu, because there were many decisions to be made. The members of the Schwaben Club worked hard to build a home of their own. They formed a Youth Group in their second year, and on weekends, there were youth dances held in the Winter Garden. In 1933 a German School was established, with Pastor H. Walter teaching. A Theatre Group was also created which performed at the Winter Garden. 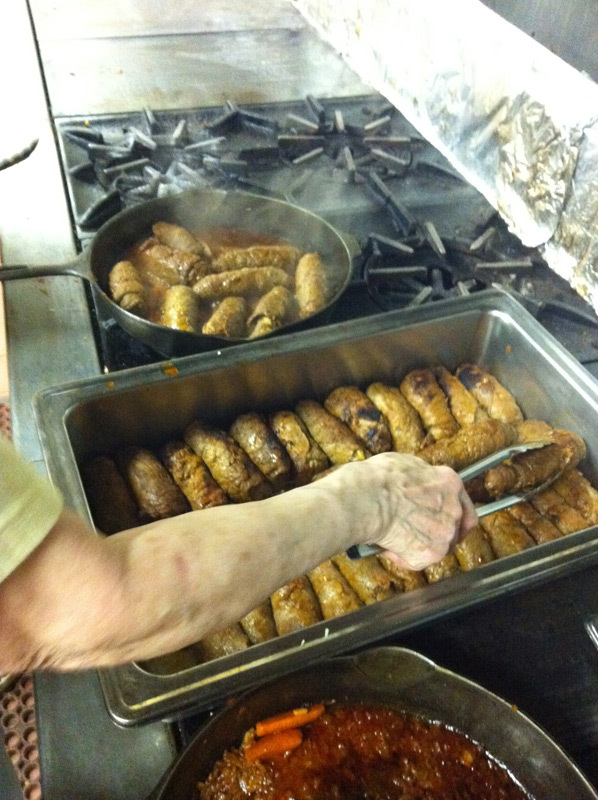 In 1935, the Club celebrated its first Trachtenfest , showcasing original Trachten brought over from the homeland. 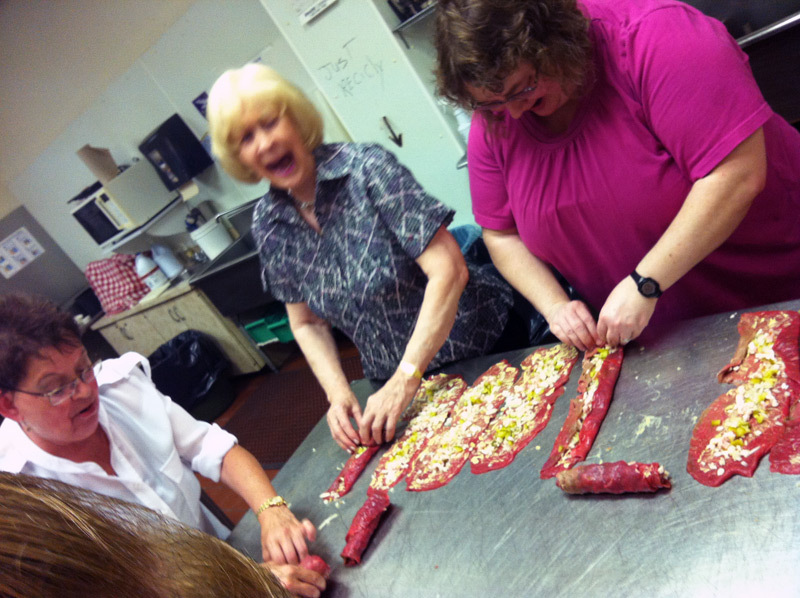 The Ladies’ Auxiliary was also formed that year. 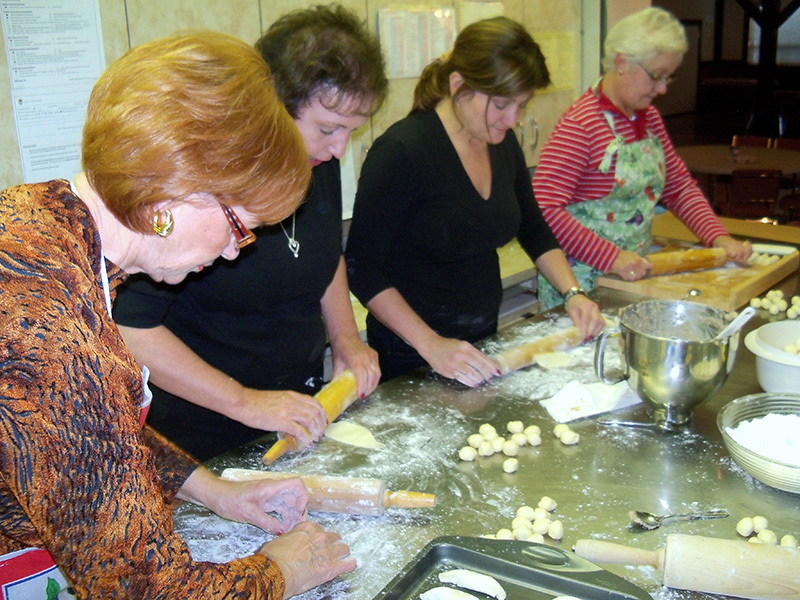 The Ladies held bingo nights and bazaars to raise money. 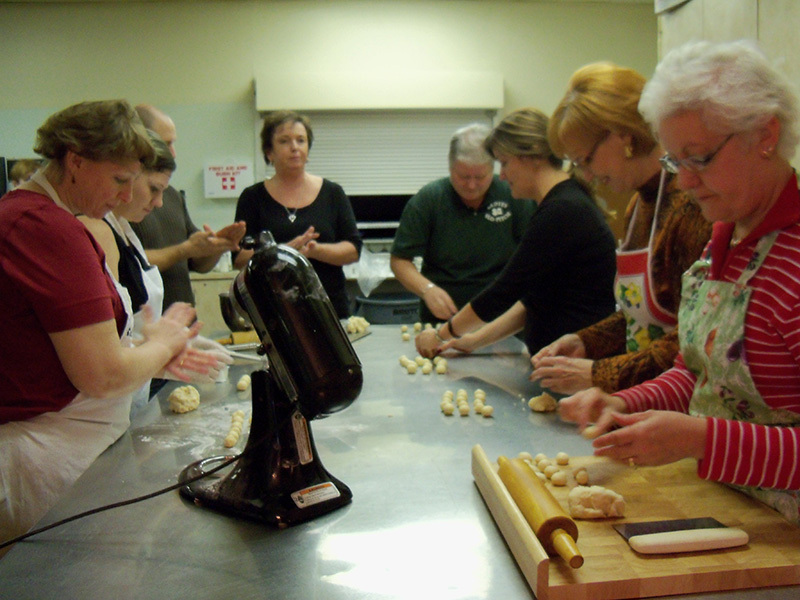 By starting their own group, they were hoping to financially contribute to the Club’s growth. 1939 saw the beginning of the Second World War and the Club was forced to cease all activities. 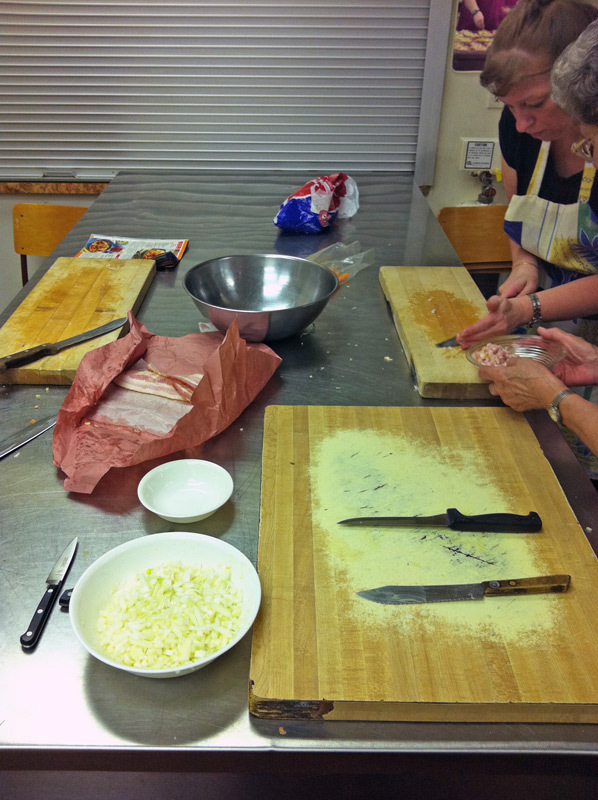 It continued to aid its members through the Sick Benefit Fund; the Canadian government sanctioned this aspect of the Club’s mandate. In 1941, the Death Fund was established to assist families with funeral costs of members; the fee for that service was $1.00 for each passing. The Death Fund still exists today but is not used much anymore — it is closed to new members. 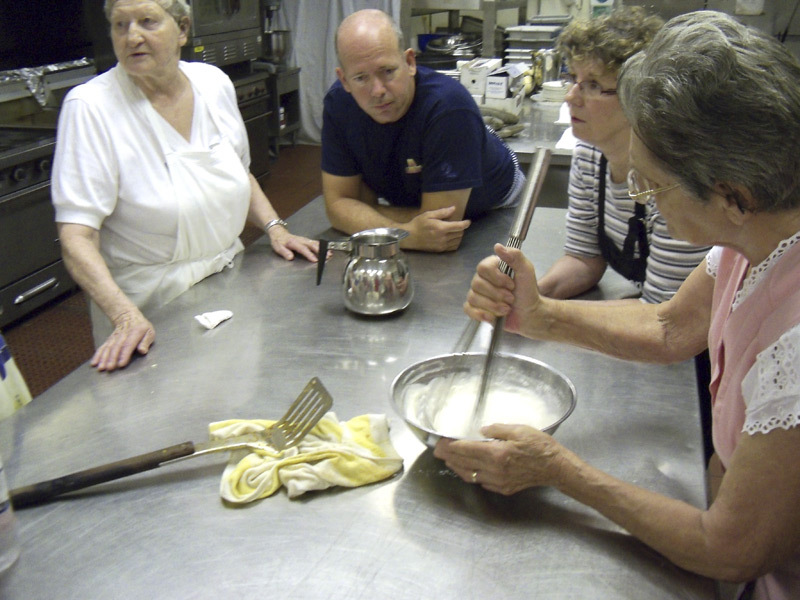 In 1947, the Club was allowed to become active again; functions were held and group activity started up with renewed enthusiasm. On January 19th, the Schwaben Club was recognized by the Province of Ontario as an official Cultural Club. The official name of the Club became the “Canadian Schwaben Sick Benefit Association”. The next wave of immigrants from the old country arrived shortly after that. Real estate agent Wilfrid Bitzer found a suitable building to hold the ever-expanding membership. It was a vacant, old warehouse located at 1668 King Street East in Kitchener. The Executive of the Club decided that the property would be the ideal location for their new home. 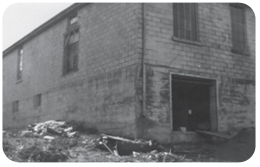 In July of 1948 the members started to renovate the warehouse, transforming it into their new home. 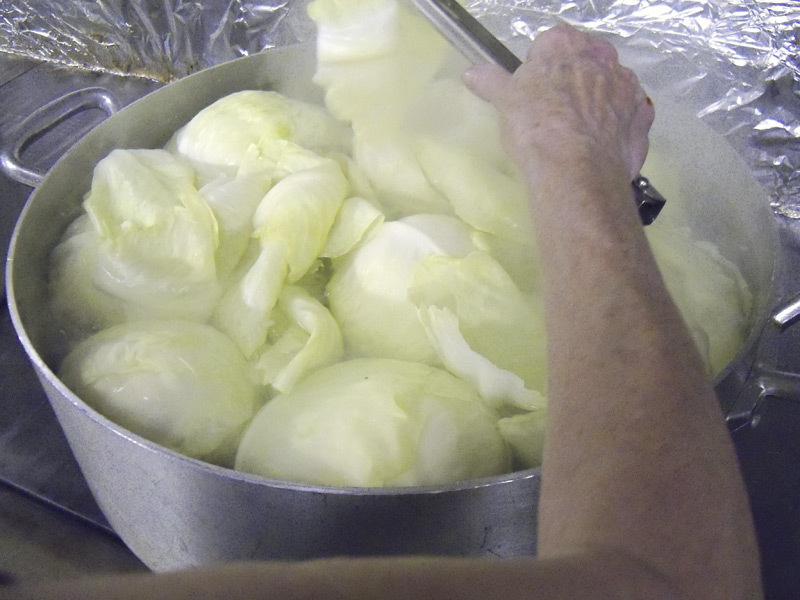 Many members worked all weekend including late into the night on Sundays. 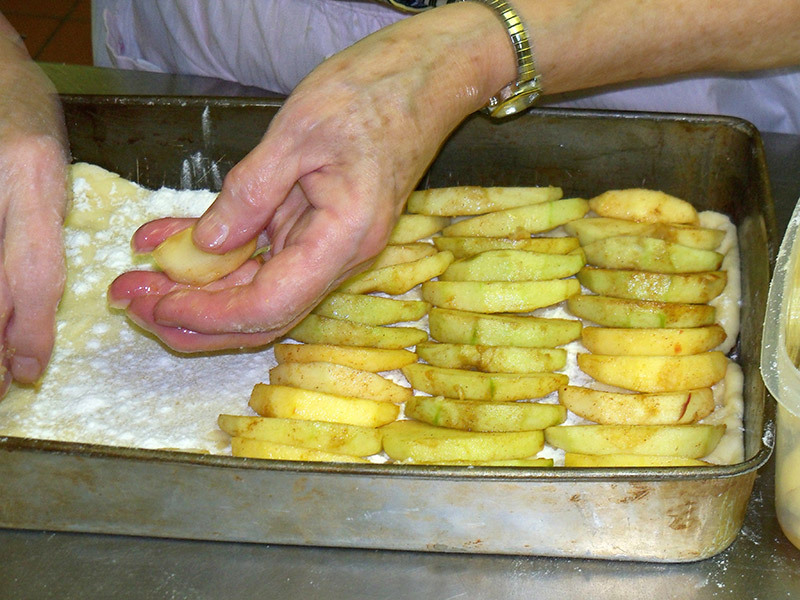 The Frauengruppe prepared many of the meals for the men. Finally, in October, the new building was ready. 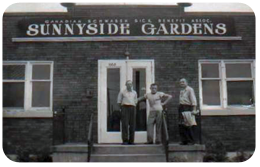 There was a grand celebration — the new building was to be called “Sunnyside Gardens”. As more immigrants arrived, more groups were created. The first major group was the Soccer Club; they called themselves the Victoria Soccer Club. Also in 1948, members celebrated the first Kirchweihfest. Later that year, they celebrated the 1st Club Anniversary Ball as well. A German School was once again founded in the Club. This time the teacher was Peter Quiring. The Club operated the school for only one year. After the first year, the club then handed control of the school over to Mr. Quiring, who eventually moved it to his residence. It was renamed “The Private German School”. The remainder of the mortgage was finally paid in full. The city of Kitchener approached the Club with a request to purchase a portion of Club land. 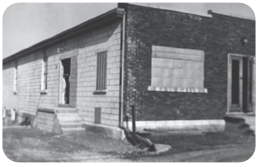 Shortly after the sale was completed, Weber Street was built behind our Club. This now gave us two entrances to the property. Another portion of the property was then sold to the Waterloo County School Board, onto which they built Eastwood Collegiate Institute and its soccer fields. The Club was approved for a liquor licence, although the licence had to be renewed every month. One of the duties of the Vice-President became the travelling to Toronto to renew the licence. 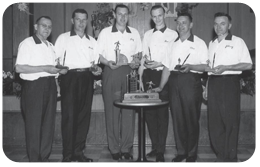 A bowling league was formed, and the Club’s team was named the Olympic Bowlers. The team won several awards over the years under their captain Tony Sertic. 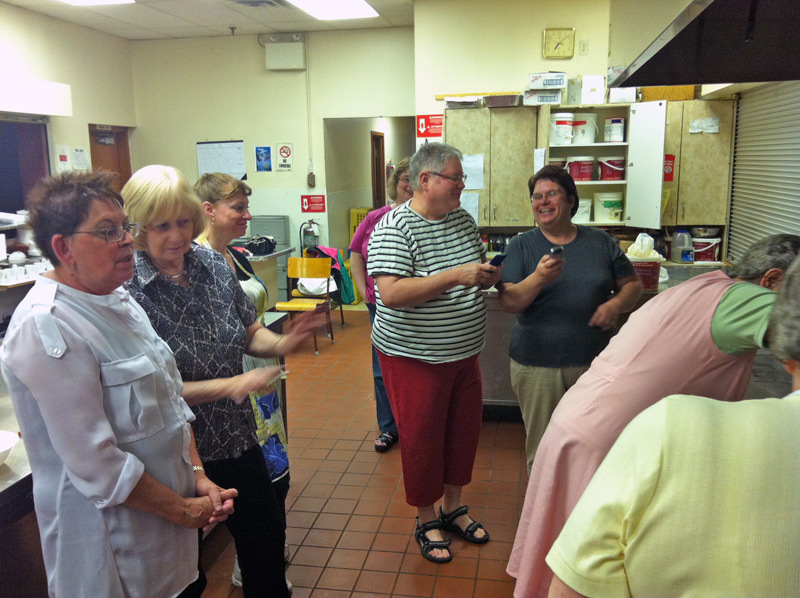 Saturday night dances were a weekly event; Club members enjoyed the good times and fellowship. The Dance Groups were also becoming very successful. They often danced not only at Sunnyside Gardens, but also at other clubs in the area. The Youth Group formed a Theatre Group to expand their cultural studies. 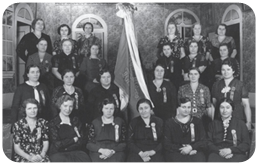 The Ladies’ Auxiliary continued their support of the Club by buying furniture for the office, and sewing the curtains for the hall. Back then, the membership dues for the Frauengruppe were $1.00 per year. The Beer Keller was made into an entertainment room for the members. There was a pool table, ping-pong table, and many other games. The games brought in a considerable amount of revenue for the Club. However, only members could come into the Beer Keller. A member could only bring one guest per visit; they were required to sign in a guest book. This was mandated by the Liquor Board. 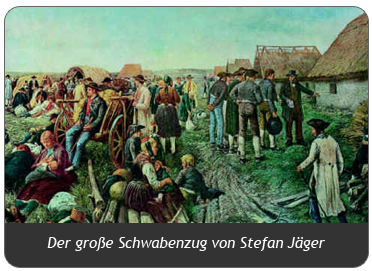 The first Tag der Donauschwaben was held: 1500 fellow Swabians from across North America attended. The celebration lasted for three days. 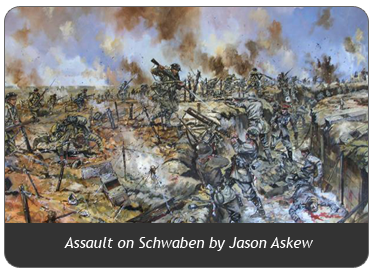 Kitchener-Waterloo became known as the “Heart of the Danube Swabians”; it was a very exciting time to be a Schwob. The Club then purchased the neighbouring building. It was renovated and became another dance hall for the children and the youth groups. This hall was named the Schwaben Hall. The Youth Group, under the leadership of Günther Haas, performed in Toronto at Maple Leaf Gardens for Princess Alexandra of the Netherlands. The Youth Group also competed in Tennessee in a Folk Dance Competition and won first prize. The group arrived home to much fanfare and congratulations from both the Mayor and other local dignitaries. It was at this time that the Club’s name was changed from Sunnyside Gardens to Schwaben Club. 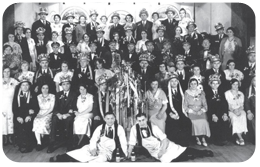 Later that year, the Club celebrated its first Oktoberfest, with the doors open to the general public. This not only helped the Club financially, but also brought in new members. 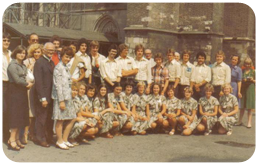 Our Youth Group traveled to Germany numerous times, to sightsee and perform across the country. 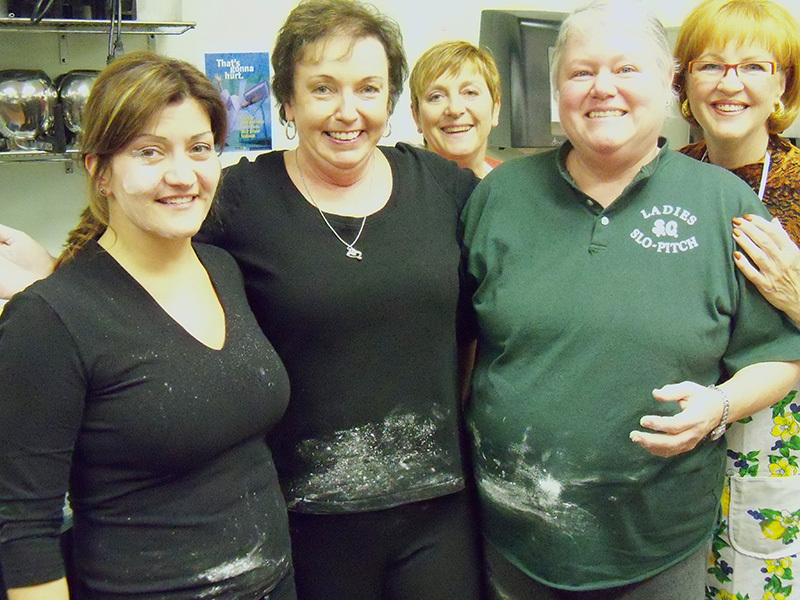 The Club partially supported them financially, but they fundraised most of the money through dances and other events. In 1972, a lawyer named Mr. McGibbon assisted in changing the Constitution. There was a second form of membership created — it was called a Social Member. The social member had the right to vote in elections, but could not run for positions on the Board of Directors. This change had to be approved by the Liquor Board before becoming final. In order to enter the Beer Stube (Keller), all members were now required to use a key card. Guests were allowed only when accompanied by a member and they still had to sign the guest book. A covered breezeway was built to connect both halls; people now could walk from one to the other. 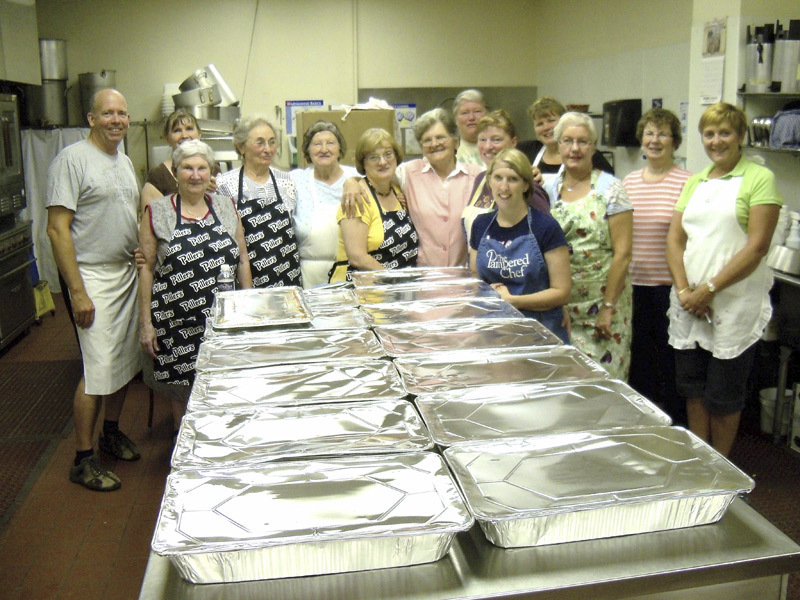 Joining the two halls together was not only convenient, but also helped financially. The members that had donated money in the 1950’s to help finance the start of the club were now receiving their money back. President Adolf Fischer introduced a new bookkeeping system that was more accurate and efficient than the old method. He was also the man that introduced the slogan, “If you had a good time, you had it at the Schwaben Club”. Many Club Presidents today continue to use variations of that slogan. The 70’s and 80’s saw the start of a youth Ballroom dance program taught by Ron Gosh; it was very much in demand. 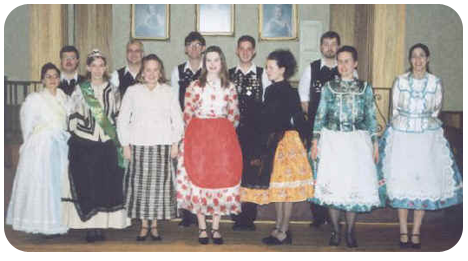 In the late 70’s, a group of senior members travelled to a Trachtenfest in Cleveland, Ohio and on their return home, decided to form the first Danube Swabian Trachten Group. This group went on to become a very well known dance group, not only for their attractive costumes but also their beautiful dance routines. 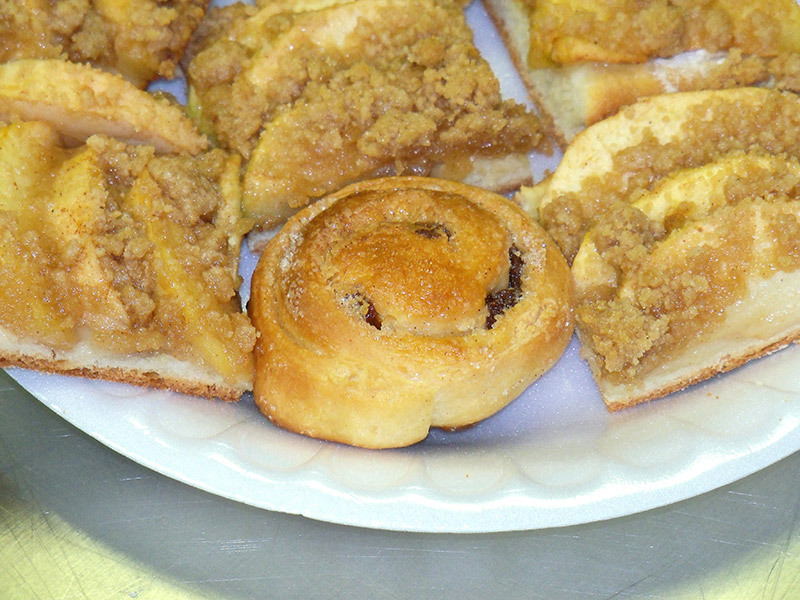 The Schwaben Club launched a yearly festival that featured homemade donuts (Krapfen). 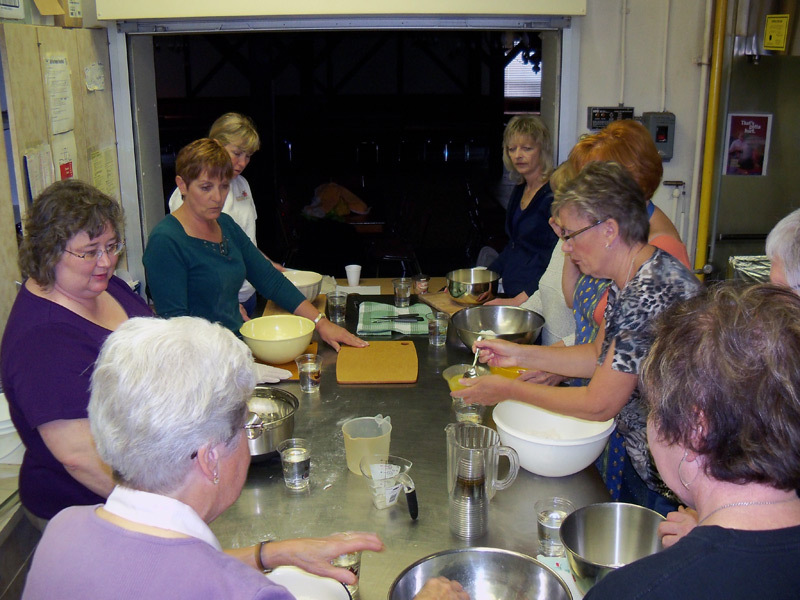 This became a very popular event with our members. In 1981, Mr. Stefan Jauch began his Presidency of the Club. He would become the longest-serving President, leading the Board for 18 years. He introduced new pins to acknowledge members reaching 10 years or more of membership — they were first presented at the 50th Anniversary banquet of the Club. In 1982, another portion of the Club’s property off Weber Street was sold. The building and land is presently the home of World Gym. At a special meeting, the members voted to carry out further renovations to the Schwaben Hall and Main Hall (the Lenau-Donau Hall). This construction allowed the installation of a modern kitchen, which could handle catering for up to 600 people. The Schwaben Hall was remodeled in the theme of a Black Forest house, and the stage now featured custom theatre curtains. 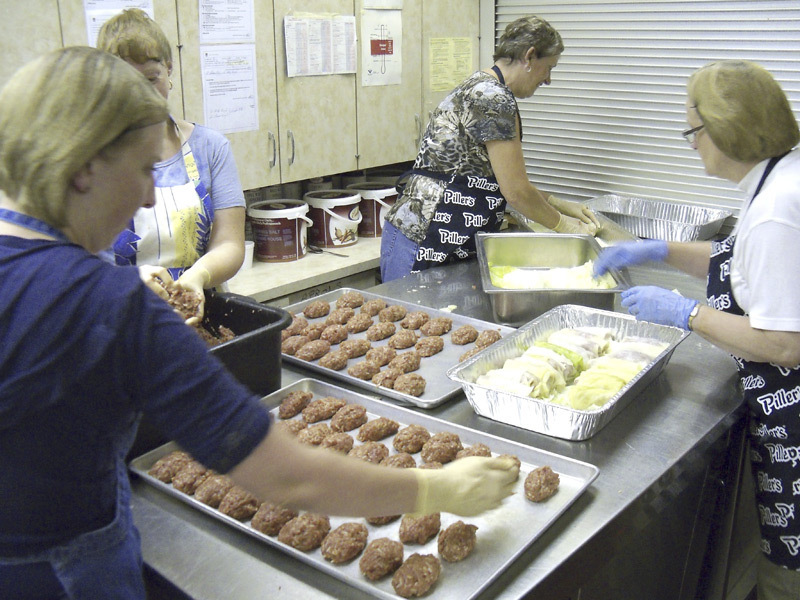 During this decade, a yearly picnic became a tradition at the Wilmot Rod and Gun Club. 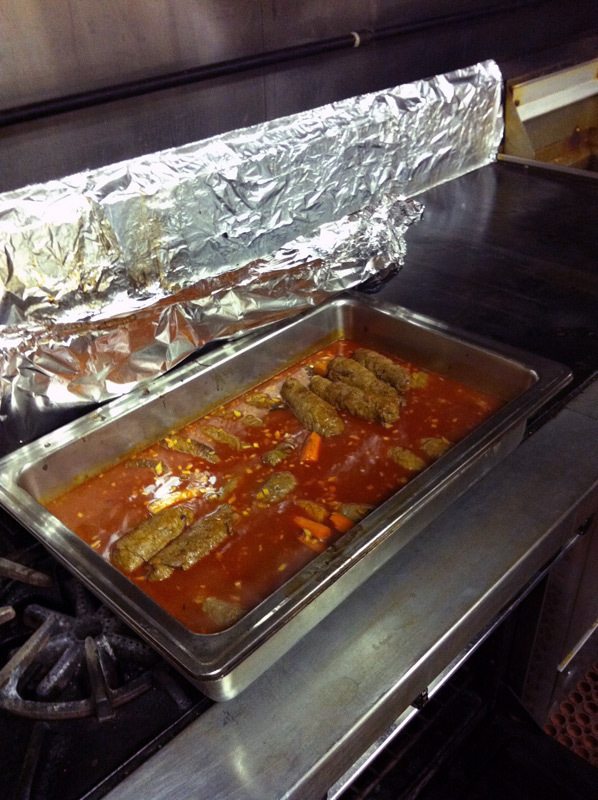 There was homemade German food prepared by the Club kitchen and brought to the picnic site for the members to enjoy. There was music played by a young group known as the “Golden Keys” (this band is now one of the most popular bands in Ontario for their Polka and Oberkrainer-style music). Games were organized by the Youth Group for both children and adults. 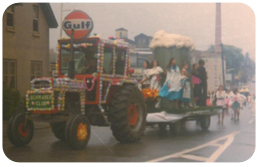 The five German Clubs (Alpine, Concordia, German-Canadian Hunting and Fishing, Transylvania, and Schwaben clubs) assumed the duties of constructing a float for the Oktoberfest Parade. Mr. George Kraehling Sr. was the organizer for the Schwaben Club. Then, in 1987, the Club constitution was reformed again. This was the last major change. There would now be only one class of member in the Club, and every member would be eligible to hold a position on the Board. There was also an increase in banquets and events, so there was now a need to hire a manager to run the club. 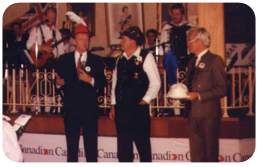 With the Clubs popularity soaring, Prime Minister Jean Chretien visited the Club where he was greeted by President Mr. Jauch. 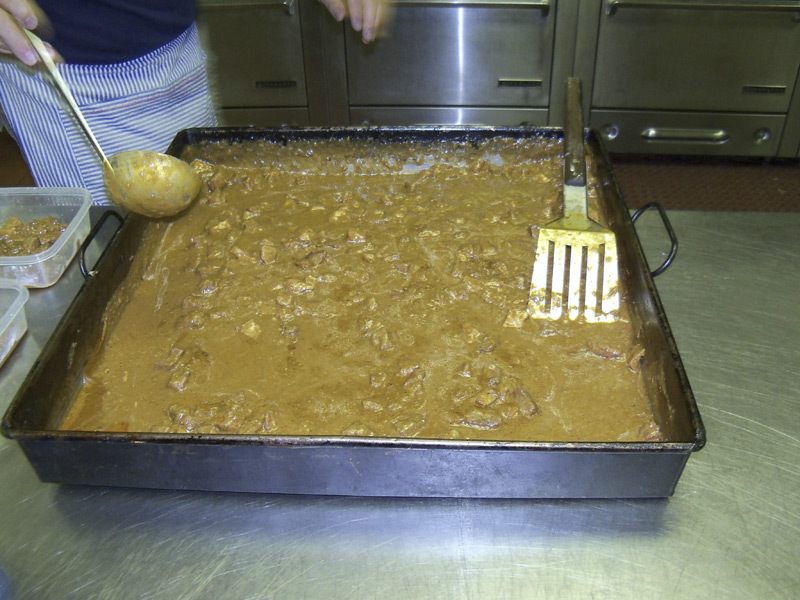 The Prime Minister was immersed into the German culture and even tasted our famous Schwaben Club schnitzel. In January 1994, due to extremely cold weather, a pipe froze in the Main Hall and caused over $10,000 in damage. The water damage was so extreme that water ran into the parking lot. The flooding occurred at night, and was only discovered by the police in the early morning hours. The repairs had to be completed in 4 weeks to be ready for the 63rd Anniversary (Gründungsfest). Occasionally, on Sunday afternoons, Fred Schiller would show German movies in the Beer Keller. It was an event that everyone was welcome to attend and had no cost. 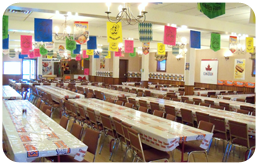 On the Sunday before each Oktoberfest, decorating of the halls is completed. It is done by the sponsors’ own employees as well as members of our own Club. This event is a lot of work but is well worth the effort, as the end results are beautiful, festive-looking halls and a great home-cooked meal for all, made by our own kitchen. In 1997 there was finally an increase in the membership fee for all members. This was the first increase in membership fees in a great many years. It was to help cover the increased operating costs. There was a new transformer installed in the basement by Ontario Hydro. The permission for the installment was given by President Jauch. The increase in power was not only for the Club, but for the entire block. 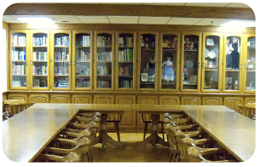 The room beside the Beer Keller called the Heimat Stube (Heritage Room) was equipped with built-in cabinets, so the Ladies’ Auxiliary could now showcase memorabilia of their many accomplishments. The Children and Youth groups were also very active. There were many opportunities for them to dance within the Club and at schools and retirement homes. In 2001, a new dance group, the Donau Dancers, was started. 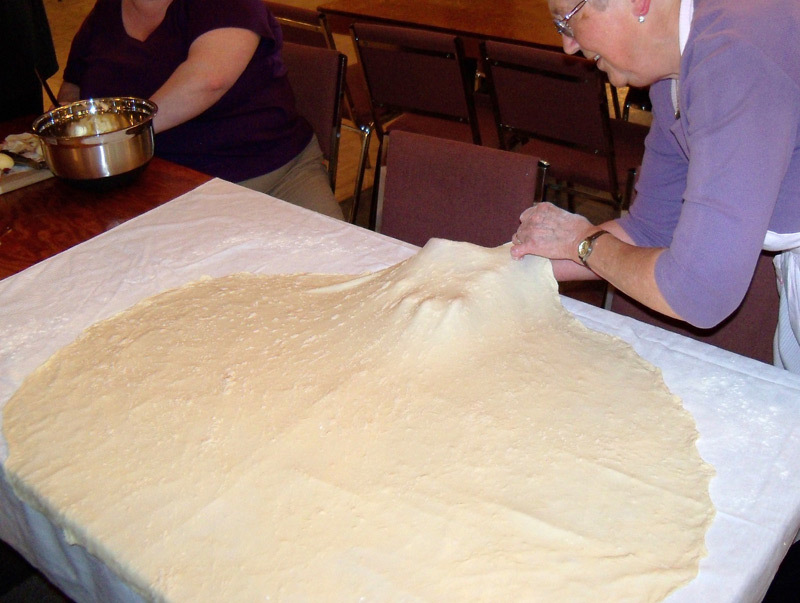 It was a revival of the traditions of the Trachten Group of the 1980’s. Their first costumes were the original Trachten from that group. The founding members of this group were from the Youth Groups of the 1960’s and 1970’s; George Kraehling, Monica Anstett, Rosemarie Brenner, Anneliese Kraehling, Dieter Vogt and Walter Marzinko. They continue today and are always accepting new members. They are very active, performing at Club functions and local and international events, where they are always well received. 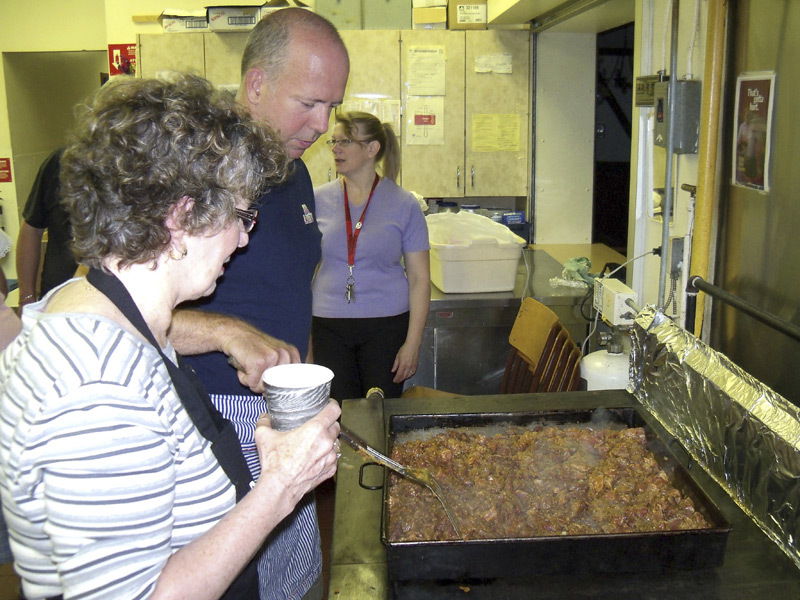 2006 marked the 75th Anniversary of the Schwaben Club. A special committee was assembled to create an anniversary book which chronicled the Clubs history and was given to all members in commemoration of the event. This hard working committee consisted of: Frank Nemeth, Günther Haas, President Dieter Hanke, Judy Hanke, Monica Anstett, and Andrea Adam. 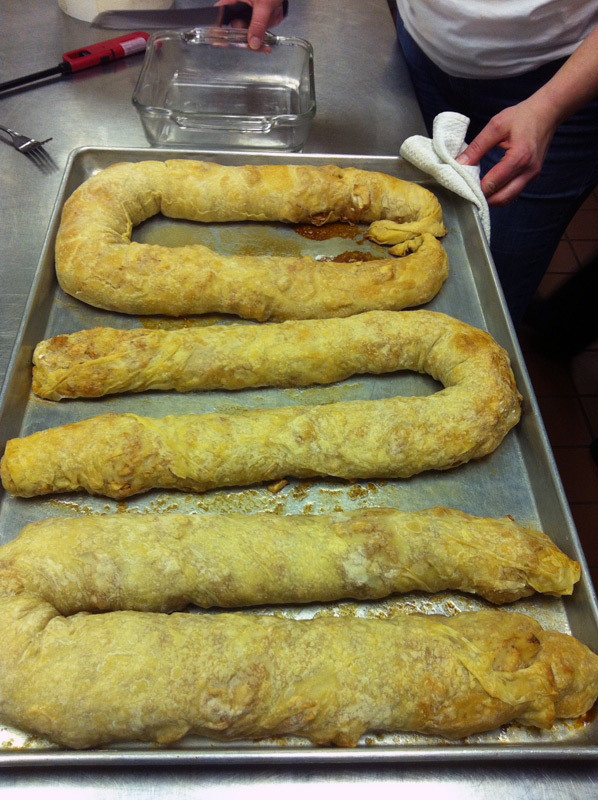 A huge Gründungsfest celebration was also held to mark the occasion. Having restarted in January 2008, the Kindergruppe and later the Jugendgruppe are now both bigger and more popular than ever. All four Club dance groups now perform regularly around South-Western Ontario, taking their pride in their Club with them wherever they go. Since 2010, there have also been monthly German movies shown once again in the Club. People from all over the region come to enjoy an afternoon of film, coffee and cake. Monies raised go back into the Club to purchase needed items like electronics, computers, and other equipment. 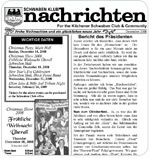 In early 2008, the Heimatbote was discontinued (the newspaper of the Schwaben Verband), so the newsletter, Schwaben Club Nachrichten, was initiated in its place. The first issue launched December 2008 and continues today. 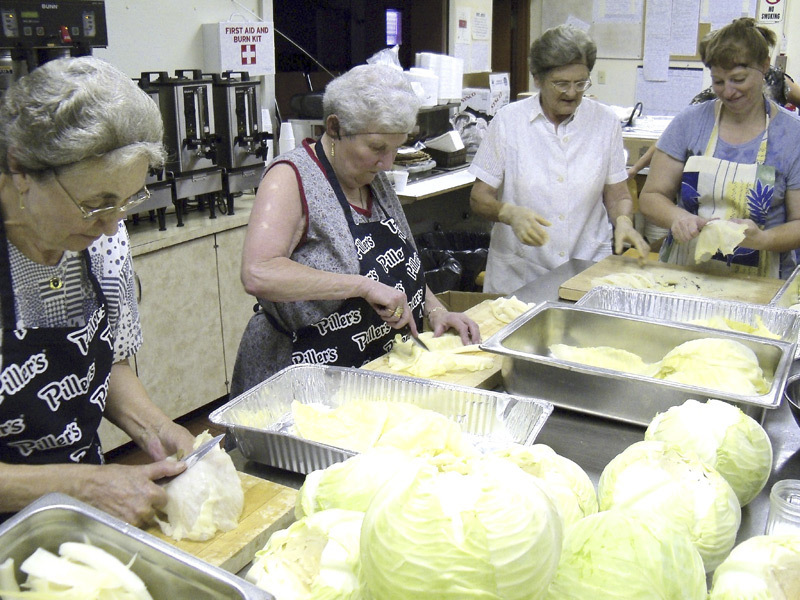 With four dance groups, the Frauengruppe, the Schwaben Sänger, and the Family Bowlers all making up our wonderful family, the Schwaben Club is one of most successful German clubs around. Always accepting new members regardless of heritage, only a love of Schwaben and German culture is needed. We may not know what the future will hold — but we do know that we will face it together! Over the years, many great people have accepted the responsibility of the highest position on the Board of Directors. 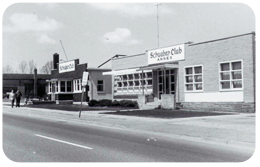 Under their guidance and leadership, the Schwaben Club has become the strong, cultural leader that it is today. Here is a list of all our past Presidents — may they never be forgotten. Wachet auf, es ruft die Zeit! Haben treu wir uns bewahrt. Was dein Schicksal immer sei! Hier ist Kraft sie zu besteh’n! Das ist deutschen Volkes Wehr! Ewig dich der Eintracht Band! Arise, the time has come! we remain true to them. we remain true to our homeland. here you will find the power to overcome! you will descend into dishonour. That is the German people’s defence! throughout the beautiful land of the Hungarians! eine Heimat in Fülle und Pracht. mit kühnen Mut und Schwabenfleiß geschafft. Heimat der Donauschwaben so schön. Du warst die Perle im Donautal. Wir tragen dich im Herzen mit uns, verschollener, heiliger Gral! Wohin wir auch vertrieben in viele Länder zerstreut; schaffen und bauen wir in Ehren und Fleiß, bekunden täglich auf’s Neu: wir lieben die neuerwählte Heimat, gedenken der alten in Treu. There are three fields to the crest. As a distinctive imperial sign, the eagle holds his wings protectively over the Pannonian countryside (Roman province) in the central region of the Danube, and symbolizes the obligation of the Holy Roman Emperor to protect those borders of the empire. The emperor Charlemagne chose the eagle as an imperial symbol in the 9th century, and since the 12th century it has represented power and unity in the German coat of arms. Colours: The eagle is black and the background is yellow. 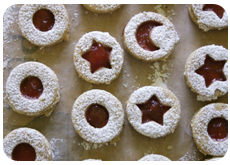 The wavy chevron symbolizes the Danube — the river of destiny for the new ethnic group on which the ancestors traveled in box-boats called “Ulmer Schachtel” (named after the city of embarkation, Ulm). They settled on both sides of the central Danube regions from the Raab River in the north-west to the Iron Gate in the south-east, partially as the emperor’s guards along the defensive military border (protecting against further attacks). A German landscape was thereby created. The geographical aspect of the group’s name refers to the Danube, however, the ethnic content does not refer to a regional dialect, but rather to ethnological and historical factors — combined with settlement and folklore — and has become an understandable expression. Colour: Blue. Amidst the fertile farm land which the Danube-Swabians made arable stands the strong fortress of Temeschburg (Timisoara), the symbol of the imperial, German defense fortifications and military border to protect against the Turks. The fortress flanked by the half-moon, the temporal symbol of Islam representing the Turkish threats to Europe which were declining during the 17th and 18th centuries. Then there is the bright rising sun, symbol for Christ, who is honoured as the sun of justice and true light — a focal point for the future, and therefore representing victory and a new beginning for the Western, Christian culture against the barbarity of the retreating Islam. This victory was accomplished through the Imperial government and Danube-Swabian settlement in the Pannonian basin during the 18th century. The six towers of the fortress represent the six regions of settlement for the Danube-Swabians: Little Alfold (the mountains of south-western Hungary), Swabian Turkey (south of Lake Balato, Slavonia-Syrmia, Backa (Batschka), Banat, Satu-Mare with the Crisana-Maramures region. Colours: The city, towers, and sky are white and the fields are green. The sun is gold and the moon is blue. The roofs of the city and towers are red. The coat of arms contains Germany’s national colours — black, red and gold. The symbol of German unification as well as the colours of the German League, are incorporated into the coat of arms because the Danube-Swabian’s history developed within the framework of the Holy Roman Empire (under German kings) until 1806. White is the symbol for the peaceful sentiment of Danube-Swabians; green represents hope and also the new fields of their homeland which were cultivated into a grain region. The writing on the crest says “Semper atque semper liberi ac indivisi” or “Always Free and Undivided”. It probably refers to the fact that the Danube Swabians were once a free people in a united country, and that although they desire that again, given the consequences of the two world wars, it can forever only be a dream. Es gibt drei Felder ins Wappen. Der Reichsadler, schon seit Karl dem Großen, kaiserlichesWahrzeichen. Karl der Große lebte von 02.04.742 bis 28.01.814 und war König der Franken. Er wurde im Jahr 800 zum Kaiser erhoben. Farbe: Der Adler hat die schwarze Farbe und der Untergrund ist gelb. Die Festung „Temeschburg“ steht als Symbol für alle Wehranlagen im Südosten von Europa. Sie ist flankiert rechts vom Halbmond, dem Symbol Prinz Eugens und links steht die Sonne für Christus, der als Sonne der Gerechtigkeit und der Liebe dargestellt wird. Die sechs Festungstürme stehen für die sechs Hauptsiedlungsgebiete: Südwestliches Ungarisches Mittelgebirge, Schwäbische Türkei,Slawonien-Syrmien, Batscher Land (Batschka), Banat und Sathmar mit Kreisch-Mieresch-Gebiet. Die weiße Farbe der Häuser und Türme ist das Symbol für die friedliche Gesinnung der Donauschwaben, und der untere Bereich ist grün für die Hoffnung und den Aufbau im Donauraum von einer Wildnis zur Kornkammer Europas. Die Sonne ist golden und der Mond blau. Die Dächer der Häuser und Türme sind in rot gehalten. Der Wappenspruch lautet “Semper atque semper liberi ac indivisi” oder “Für immer frei und ungeteilt.” Er bezieht sich wohl darauf, daß die Donauschwaben einst freie Menschen in einem ungeteilten Land waren, wonach sie sich wieder sehnen und was angesichts der Folgen der beiden Weltkriege für immer nur ein Traum bleiben wird. 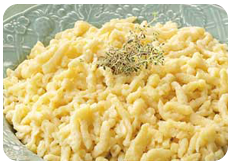 Traditional Schwaben foods are usually hearty meat-and-potato type dishes or delicious baked goods. 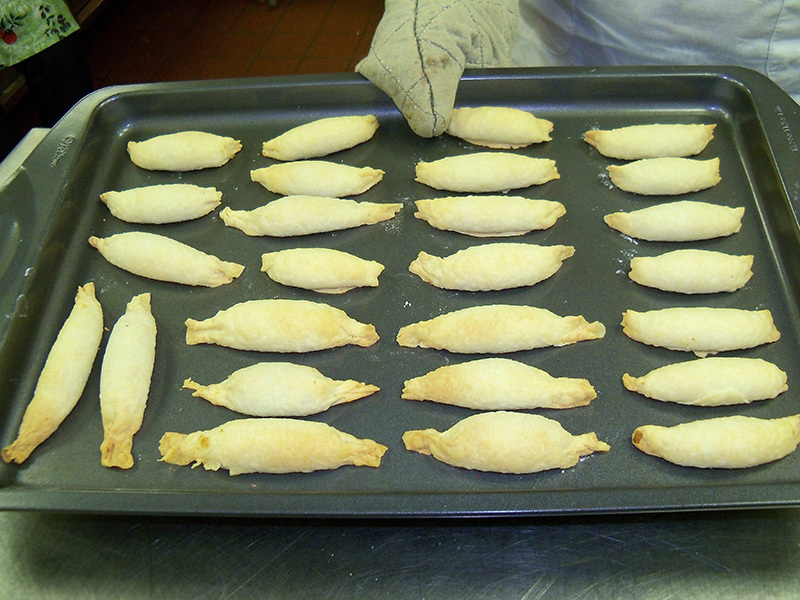 Here’s a list of some traditional treats. Food is one of the most vital aspects of a culture, and one of the most challenging to maintain and preserve for future generations. 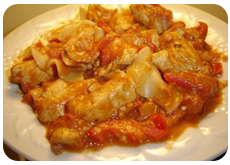 There are a great many dishes and delights in every culture, and not every family has every dish as part of their traditions. 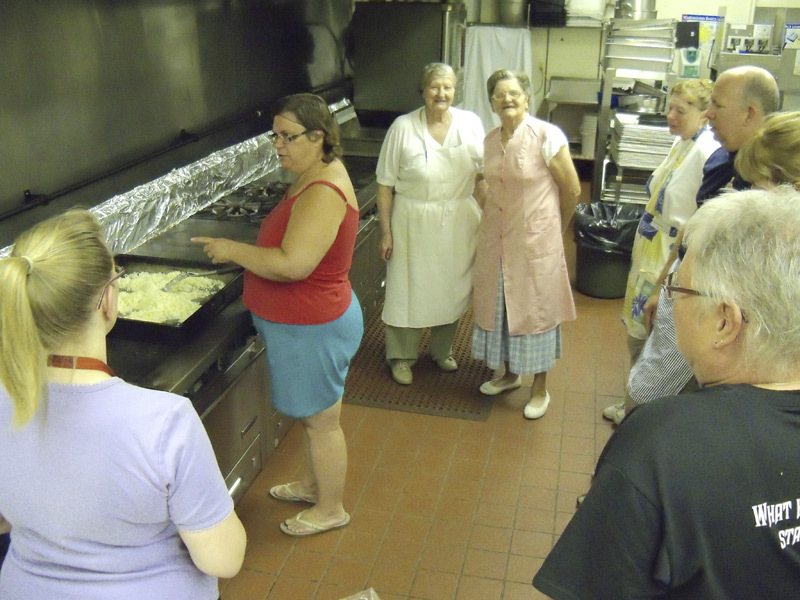 So to fill in the gap, and help in preserving our culture as a whole, the Schwaben Club hosts Cooking Classes where members can come and learn to cook the dishes they may never have previously had the opportunity to. And they’re a lot of fun too! Here are pictures from classes of the past. 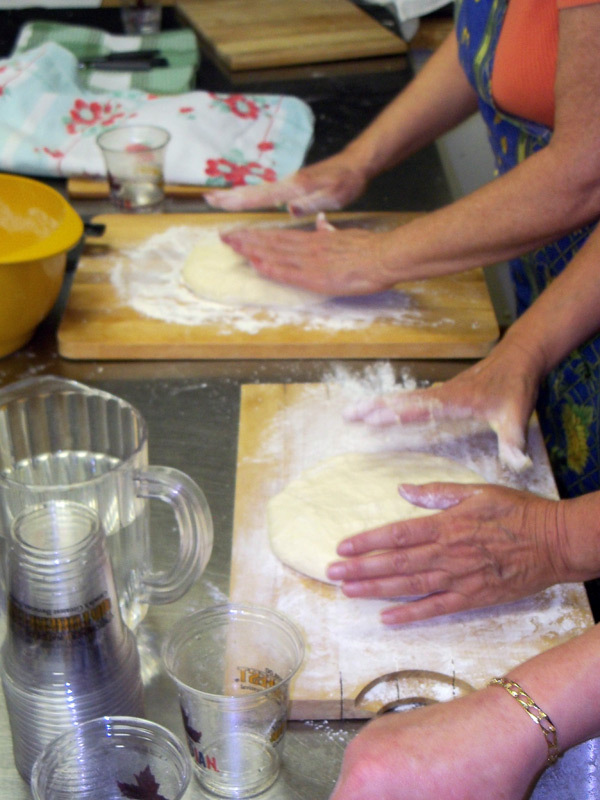 Keep a close eye out for future classes — there may be one for that dish you’ve been just dying to learn. If not, feel free to email a food request to the office with the dish you’re looking for. If there’s enough interest, we’ll put it on the schedule. 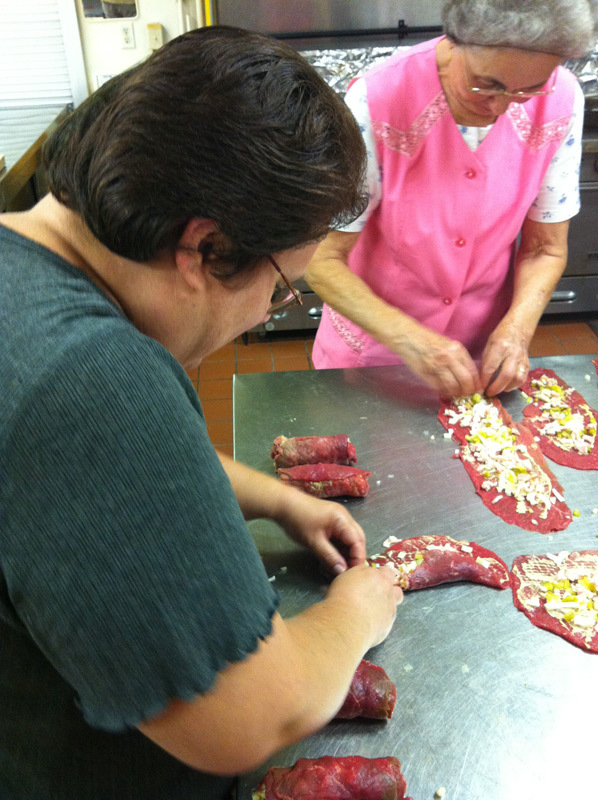 There are a lot more Cooking Class pictures on our Facebook page. Click here to check them out. The area known as the “Donau Schwaben Länder” encompasses parts of Germany, Hungary, Romania and the former Yugoslavia. However, the Schwaben culture is distinct from all four. 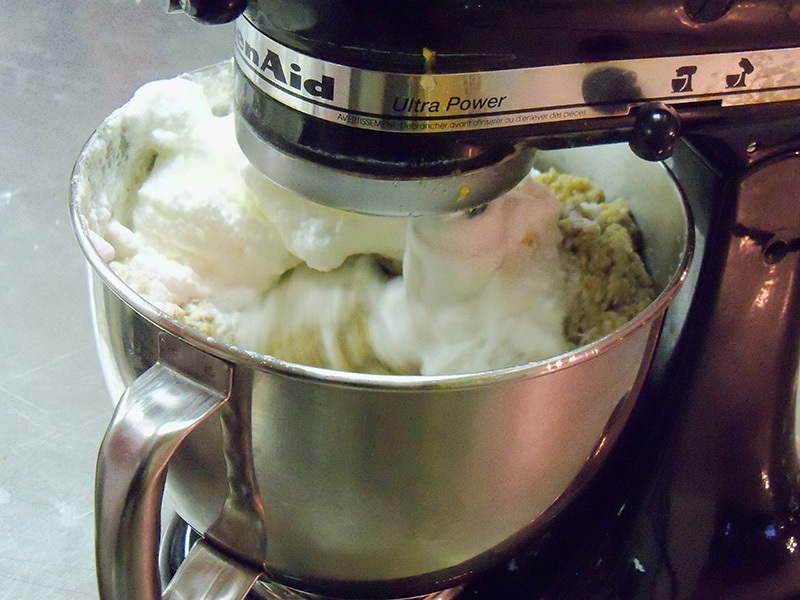 Click here to see where it all started. Scroll down to learn more about our Culture! A Donauschwaben-Canadian boy born in Canada tells the story of heading off to Saturday morning German School as a young child, confident in his knowledge of the language, only to discover he didn’t speak German — he spoke Schwäbisch! 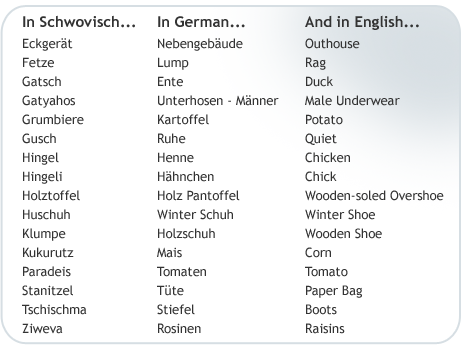 Here are some examples of how the Schwaben dialect compares to German. Although most people think of dirndls as the typical German dress, the traditional Schwaben Costume is actually a tracht . Tracht is technically a generic term referring to any traditional costume (for example, the men’s vest can also be called a tracht), but it is normally used to describe a particular type of dress. The tracht is similar to a dirndl, with a few differences. 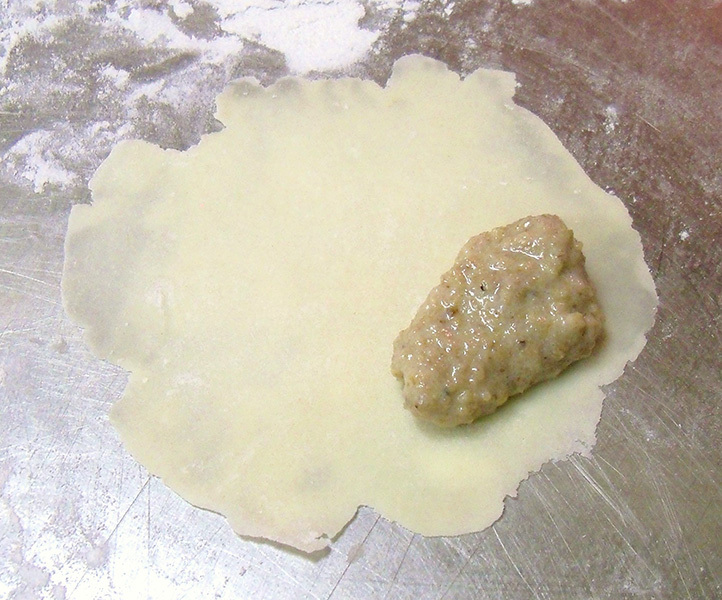 Trachts are almost always made of two pieces, with the skirt and blouse separate. The blouse is a full blouse, and is often covered by a tight vest or a large shawl crossed in front, with the ends tucked into the skirt’s waistband. 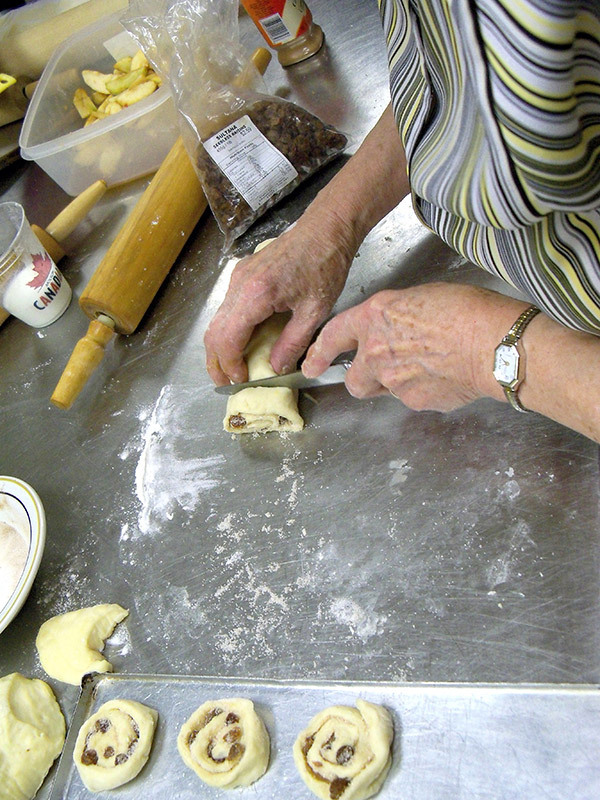 An apron is worn over the large, often pleated and starched skirt. 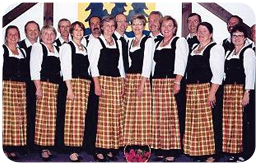 Tracht skirts are so large that some people own special carrying cases to protect the skirt’s shape in travel! Many trachts are worn with many layers of petticoats underneath to further enhance the fullness of the skirt. 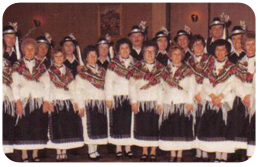 Most of the Adult or Senior dance groups wear trachts to perform in, and many of the older Schwaben women have special trachts brought over from their homelands. At larger Schwaben gatherings such as our Landestrachtenfest or Tag der Donauschwaben, there is often a fashion show, displaying these heirloom costumes and their modern counterparts. 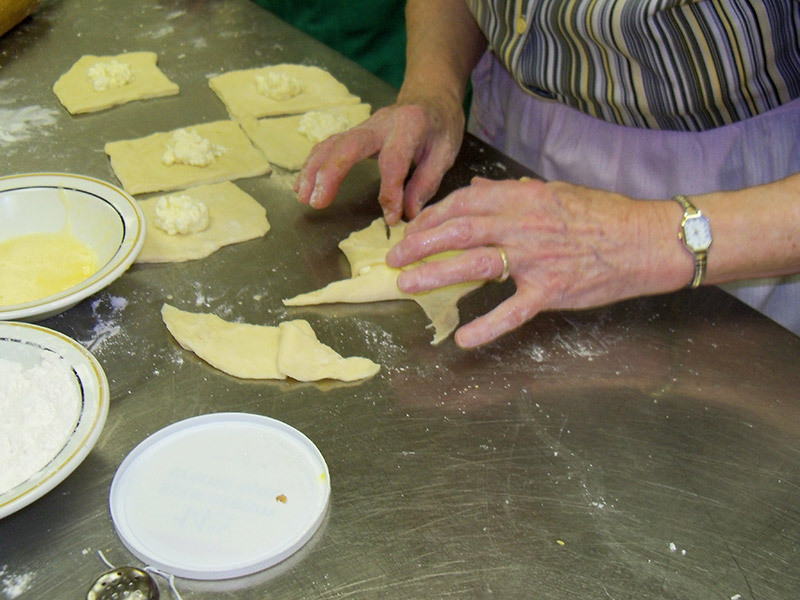 The trachts shown below are original Donauschwaben trachts, brought over from the old countries by the women of our club when they immigrated to Canada. 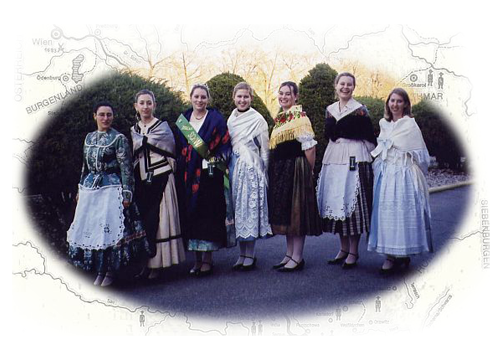 They are being worn by members of the Schwaben Dancers as part of a “Tour through Schwabenland” evening.